No matter what combat sport you participate in, the UFC branded Platinum mouthguard is for you! What is the OPRO UFC Platinum Mouthguard? 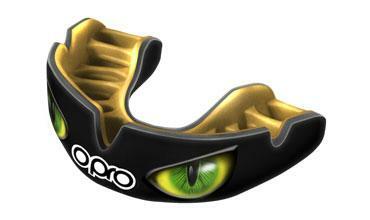 This is the pinnacle in the OPRO Self-Fit mouth guard range. Made using a dual layer construction, it provides amazing protection for your teeth and gums whilst you participate in your chosen combat sport. Each Platinum UFC mouthguard comes with an anti-microbial case meaning you can store it easily, but it also protects against 99.99% of bacteria build up. The mouthguard itself also has anti-microbial protection as standard in all Platinum level. How do I fit my UFC Mouthguard? Fitting your OPRO gum shield, is simple, easy and only takes a few moments. Each Platinum comes with a unique fitting cradle only available from OPRO. It not only helps to make sure the mouth guard is central when you fit it, but also ensures that you have a minimum amount of material left after fitting. This is vital in ensuring shock absorption is sustained. Follow the instruction in the pack or watch our easy to follow instructional video for full fitting guidelines. Why is the fit so good? The Platinum UFC Mouthguard is made using a dual layer construction for added protection and has 13 anatomically placed fins for a great fit. During the fitting process, the fins soften, so that when you bite into them, they mould perfectly to the contours of your teeth and gums. What this leaves you with is a mouth guard for MMA for fits like no other. How do I order mine? Ordering your OPRO UFC Mouthguard online is easy, secure and takes a few moments. Remember that when you order online from us before 3pm on any working day, you could start using your gum shield from as early as tomorrow! So what are you waiting for? Choose your design and experience the best boil and bite mouth guard!